On this page, we take a look at some of the innovative building techniques used by the Romans techniques so advanced that many are still used to this day and in many cases, structures built with using these techniques are still standing. The mastery by Roman architects and engineers of the arch, vault and dome further enhanced by their development of concrete helped them to solve the first problem of monumental architecture, which is to bridge space. Roofing a great area means carrying heavy materials across spaces impossible to span with the Greeks' simple post-and-lintel system. In the arch, and the vault that grew out of it, the Romans had a means of thrusting the massive Colosseum walls story above story, of covering a luxurious bathing hall that could accommodate three thousand persons, and of creating the majestic form of the Pantheon. The Roman arch was the foundation of Rome's architectural mastery and massive expanse of building projects across the ancient world. It allowed the Romans to make bigger buildings, longer roads, and better aqueducts. The Roman arch is the ancestor of modern architecture. The Romans had a great liking for arches and made use of them in as many different buildings as possible. They were the first builders in Europe, perhaps the first in the world, to fully to appreciate the advantages of the arch, the vault and the dome. The Romans introduced stone arch technology over two thousand years ago. They applied to bridges they constructed across the known world and examples can still be seen today. 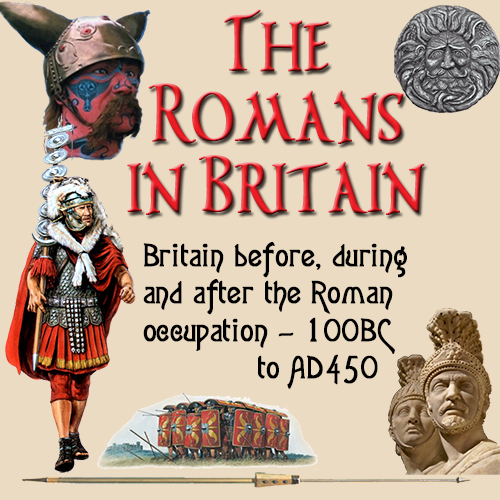 The technology they used has stood the test of time and some Roman construction methods are still used today. The arch is an prime example of Roman technology that is still used world wide even though modern materials are now used. They were mainly constructed by placing individual tapered blocks together in such a manner that they pushed against one another and generally did not need any cement or bonding material between them. Firstly a wooden frame known as a centre or centring was built that spanned the gap where the arch would be, and it was shaped in the same arc of the arch. Then the separate stones (voussoirs) were laid from the edges, until only one stone remained to be laid. This was the keystone and it was this one that gave the arch it's strength and rigidity. The frame was then removed and the arch left standing. Roman builders did not really understand the laws of physics that or what made an arch not this wasn't not fully understood until the 18th century; yet the Etruscans, and after them the Romans, developed empirical methods for designing arches which still stand more than 2,000 years later. You don't need to be an engineer and kow the theory to build things, you just need to know how to do it. An arch-shaped ceiling is known as a vault. Vaults come in various forms; the simplest is the tunnel vault (aka barrel vault), which can be described as a "continuous arch". The weight of such a vault demanded thick supportive walls with limited gaps. Moreover, since the height of a tunnel vault must increase along with its width, there was a practical limit on its size. A tunnel vault, or barrel vault, is a tunnel-like, semi-cylindrical extension of an arch, which may be thought of as an unbroken series of arches pressed together, one behind the other. It cannot be lighted except at the ends without being structurally weakened, because, as in an arch, continuous abutment must be applied to absorb the thrust carried down along the haunches to the walls supporting it. However, arches may be introduced in the supporting walls and transverse ribs may be inserted in the vault to concentrate thrust at a few strongly buttressed points, thereby permitting a reduction of weight and thrust in the segments of vaulting between the ribs. If a barrel vault is intersected at right angles by another barrel vault of the same size, a cross vault, or groin vault, is formed. This is a very efficient form of vaulting allowing full illumination from the sides. Groin vaults also allow a great saving in material and labor over the simple barrel vault; thrust is concentrated along the groins (the four diagonal edges formed along the points where the barrel vaults intersect), so the vault need only be abutted at its four corners. 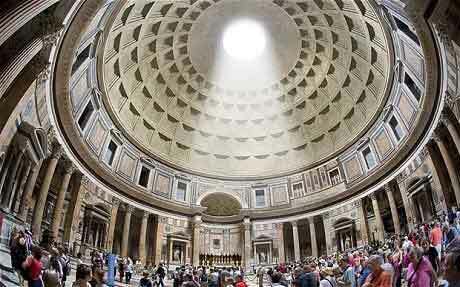 The Dome, in architecture, hemispherical structure evolved from the arch, usually forming a ceiling or roof. 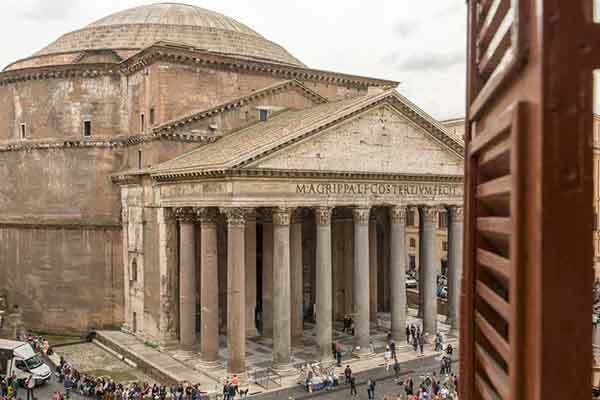 The dome exerts thrusts all around its perimeter, and the earliest monumental examples, such as the Roman Pantheon, required heavy supporting walls. 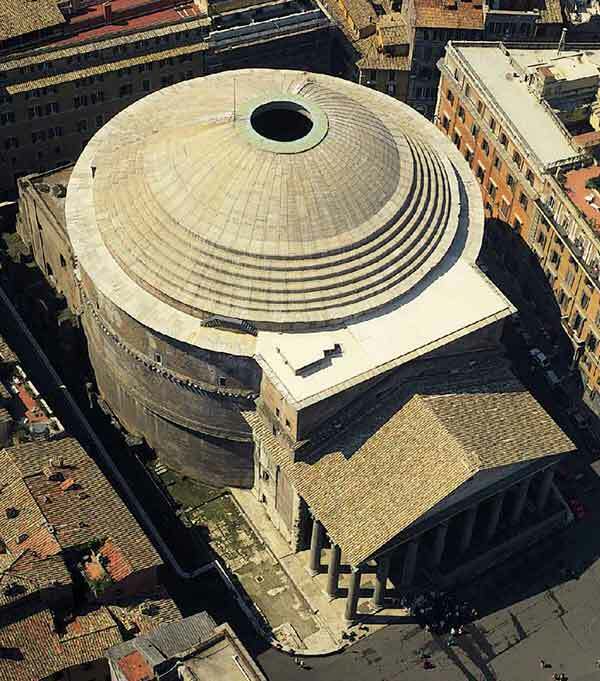 Monumental domes began to appear in the 1st century BC in Rome and the provinces around the Mediterranean Sea. Along with vaults, they gradually replaced the traditional post and lintel construction which makes use of the column and architrave. The construction of domes was greatly facilitated by the invention of concrete, a process which has been termed the Roman Architectural Revolution. Their enormous dimensions remained unsurpassed until the introduction of structural steel frames in the late 19th century. Ancient Roman tiled roofing is often found in large quantities on archaeological digs of Roman buildings but it is sometimes difficult to imagine what the terracotta fragments looked like when they were all still in situ covering a roman house. We generally find two shapes of roof tile and we call these tegulae (singular is tegula) and imbrices (singular is imbrex). 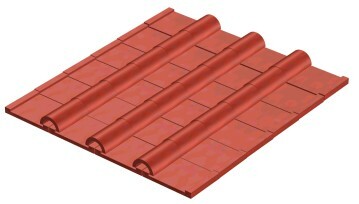 Tegulae are flat oblong tiles with raised sides. Imbrices are half pipes, slightly enlarged at one end. They fit together so that a tegula always slightly overlaps the one below it and on each side the gaps between the tegulae are covered by the imbraces. This is very similar to tiled roof construction still in use in many parts of the world today. Much of the housing stock of Europe and much of Western North America is still covered in tiles that follow this ancient Roman design pretty closely. Next time you are out and about, see if you can spot some modern Tegulae and Imbrices. Being from California, I can tell you that these kinds of roofs are quite common there, being well suited to the climate and having the benifit of being fire-resistant. A person from almost 2000 years ago would instantly find this style familiar. Even the colour is the same!